This delicate and stunning bracelet made of TOHO seed beads and rhinestone cup chain with a Swarovski pendant for a charm is the perfect bracelet for springtime. 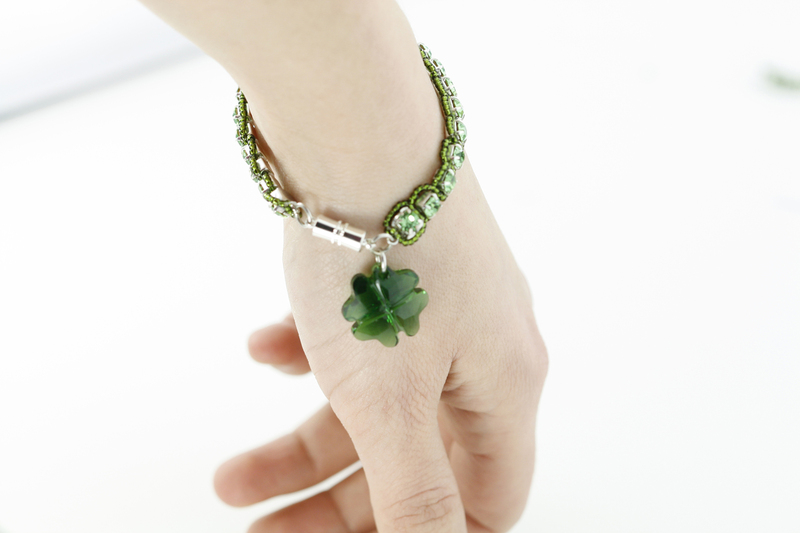 Try your luck at making this pretty beaded rhinestone chain clover bracelet with our step by step tutorial below or mix it up with your own choice of TOHO beads and rhinestone chain for a completely different look! 1 Length of rhinestone cup chain (measure this on your wrist, making sure to leave room for the clasp. Average length is 6 to 7 inches). We used 4mm Peridot Silver in this project. A clasp, any kind you have will do. We used this Wasp magnetic clasp. 1. Attach the cup chain ends to either end of your rhinestone cup chain. For more details on how to do this read the instructions here. 2. Next, find the middle of your fireline and attach it there to one of the cup chain ends by double knotting the thread below the ring. 3. Thread 6 seed beads on one line and 8 beads (6 + 2) on the other line. Take the line with fewer beads and pass it through the two extra beads on the other line (from the opposite direction) to make a loop. 4. 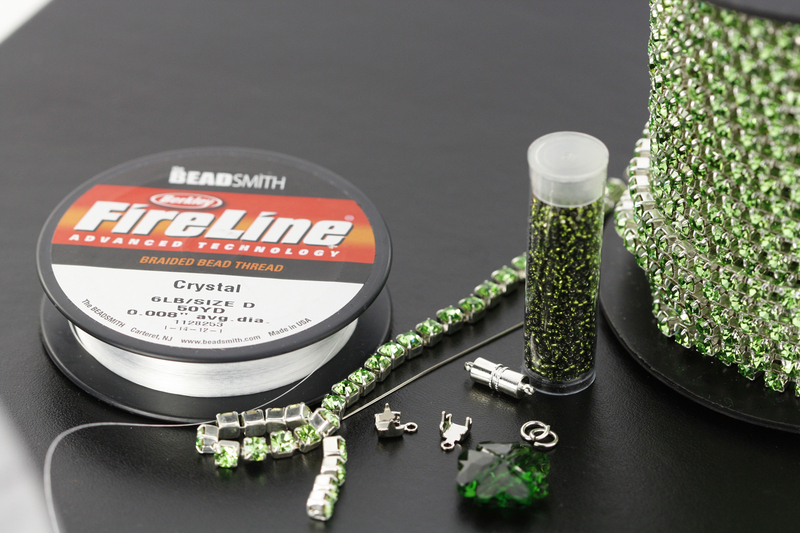 Pull the fireline tight and pull the loop over the first rhinestone in your chain so that the beaded line sits surrounding the rhinestone. 5. Now make a knot and tie the fireline on the back of the rhinestone chain. 6. Crisscross the fireline through the same two beads that already have two strands going through them (this is why TOHO seed beads, with their larger holes are the best for this). Now you are ready to begin the next loop. 7. This time add 5 seed beads on one line and 7 (5 + 2) seed beads on the other line and thread the fireline through the two extra beads as before. Tie a knot on the back of the rhinestone chain and thread the fireline through those two seed beads to get to the front of the bracelet as before. 8. Continue step 7 until you get to the end of the rhinestone chain. 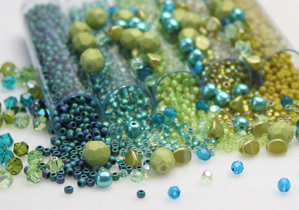 The securely tie the fireline and hide the knot in the Toho seed beads. 9. Add jump rings to the clasps and attach them to the loops on the rhinestone cup chain ends. 10. 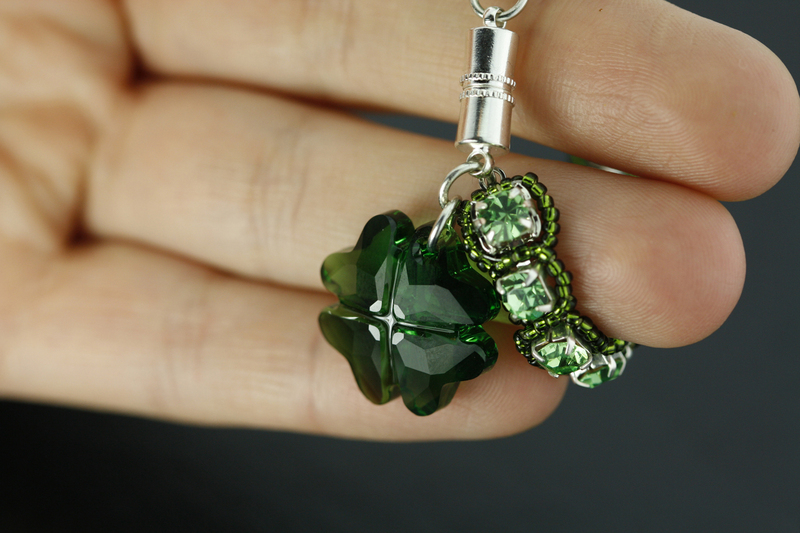 Attach a jump ring to the charm and attach it to the end of the bracelet. And your bracelet is finished! I do not understand the directions. You say to add 6 beads then 8 beads but then you say 6 plus 2. So is it 6 beads plus 8 or 6 beads plus 2 to make a total of 8? Hope this helps Kathy. You are working with 2 threads. One thread has 6 beads and the other has 8 beads. The thread with 6 beads passes through the “extra” 2 beads on the other thread so you can form a ring. Does this make more sense now?